WTF President Chungwon Choue (left) presents Kazakh President Nursultan Nazarbayev (right) with a 9th dan black belt in a ceremony held in Astana, Kazakhstan on Jan. 21, 2014. 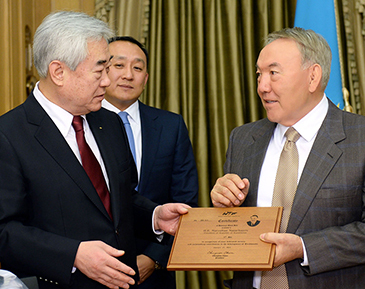 Astana, Kazakhstan; Jan. 21, 2014 — WTF President Chungwon Choue today presented Kazakh President Nursultan Nazarbayev with a 9th dan black belt – as an acknowledgement of the President’s contribution to the development of the sport in Kazakhstan. The official presentation was made during a 35-minute ceremony at the Ak Orda Presidential Palace in Astana, Kazakhstan. During the ceremony, President Nazarbayev pledged to continue to promote taekwondo and increase participation in the country, particularly amongst its young people. WTF President Choue said that the Kazakh President is positively considering building a WTF-designated Regional Training Centre which will standardise and improve the training of taekwondo coaches in the region. “We are delighted to be here in the beautiful city of Astana and to have the opportunity to officially thank and reward President Nursultan Nazarbayev for the work he has done in supporting and promoting taekwondo in this country. Kazakhstan is one of six countries currently bidding to host the WTF’s newest property: the World Taekwondo Grand Prix. The inaugural competition, which was held in Manchester, the UK in December last year, attracted 231 of the world’s best athletes from 59 countries and demonstrated the WTF’s commitment to constantly evolving and adapting to provide more dynamic and more exciting competitions – better for athletes, and for fans. Kazakhstan faces competition from China, Mexico, Qatar, Russia, and the United Kingdom to stage the first tournament of the 2014 series. “Travelling around the world always reinforces just how popular taekwondo is globally. Taekwondo is a sport for all nationalities which offers universal opportunities, regardless of race, gender or faith. Bringing the World Taekwondo GP to countries around the world will motivate and inspire the next generation of athletes and ensure that the Olympic values continue to be spread worldwide.